Ah, springtime in the desert. The desert wildflower season in Southern Arizona and the Tucson area (where so many dude ranch resorts are located) is a bit unpredictable. A good flower season requires early winter rains, and then a warm and unusually wet spring. So far, things are looking promising for a great wildflower display in the desert. But no matter what, there is sure to be something great blooming from February through May, from brittlebush to giant saguaros. Imagine saddling up at your guest ranch resort and riding through a spectacular show of brittlebush (already blooming now) and magenta hedgehog cactus. The spindly ocotillo—with its fire engine red blossoms— is blooming along with the low-growing fairy duster with its misty pink flowers. 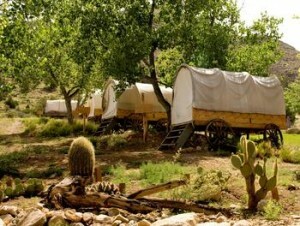 Now’s the time to go out in the desert and nip away for a warm, sunny dude ranch resort vacation. But which ranch to choose? 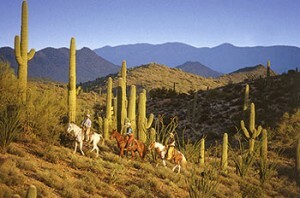 Since Arizona ranches have so much to offer, it can be a challenge. If its an upscale hideaway you want, try Hidden Meadow Ranch (near Greer), with its elegent log main house and 12 luxury log cabins; or the Rancho de los Caballeros (which has an Old West lodge, and championship golf) in Wickenburg, with its 79 charmingly elegant casitas. 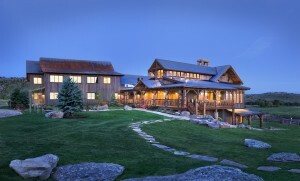 If you’re looking for casual and family-friendly, consider the Bar 10 Ranch near the Grand Canyon, with its big, country-style meals and genuine western hospitality (the Bar 10 sits at almost 4,200 feet in elevation, so March is still the off-season here, which means rates are lower). And near Wickenburg, the Flying E Ranch is loaded with family-friendly fun, wide-open spaces, and bountiful meals served family style. Both White Stallion Ranch and Tanque Verde Ranch outside Tucson offer a ton of fun things to do, from nature walks to swimming and gourmet cuisine, along with the kind of classic southwestern design and décor that many clients come for. Tanque Verde even has tennis courts and a swanky little spa out by the swimming pool. This is living! If you need help planning side trips while you’re in Arizona, don’t forget Arizona Country Excursions, which can take you on guided horseback or ATV trips through the Arizona desert. But if you need more help with your selection, turn to Ranchweb for help. To begin, click on Selecting A Ranch and you’ll see groupings of ranches by lists of all the options that various ranches have to offer, from riding, fishing, and cattle drives to spas and luxury options. 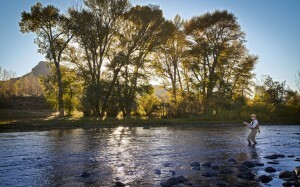 If you’re looking for deals, click on Travel Bargains on the Ranchweb.com home page. It’s another handy sorting tool.